In August 2014, the Court of Appeals ruled 2-1 in favor of the Occupy Wall Street protesters who got arrested after crossing the Brooklyn Bridge. 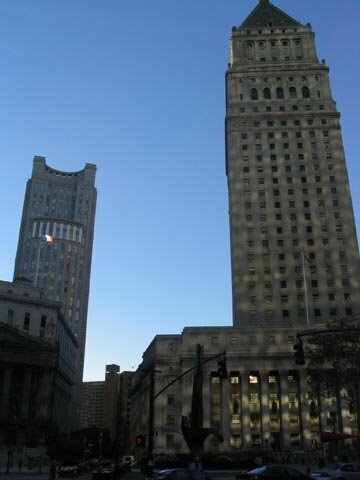 The Second Circuit rejected the City's Rule 12 motion and allowed the case to proceed to discovery. The full Court of Appeals has now voted to hear the case en banc, and the 2-1 decision is withdrawn. A new decision will issue when the full 13-judge Court hears the case on reargument. This case arises from the Occupy Wall Street movement, which sprouted in 2011 in New York City. On October 1, 2011, the protesters marched across the Brooklyn Bridge. They allege that the police allowed them to do this and even led them onto the bridge. The police initially did not prevent the protesters from walking along the roadway. While some officers eventually told the protesters to get on the sidewalk, few protesters heard this command. They were then arrested for disorderly conduct. The plaintiffs sue for false arrest. The case is Garcia v. Doe, decided on August 21. The crux of the complaint is that "'[p]rior to terminating the march when it was mid‐way across the bridge, the police did not convey that they were going to revoke the actual and apparent permission of the march to proceed,' and that the officers therefore did not have probable cause to arrest them for disorderly conduct." The officers seek qualified immunity, arguing that "an objectively reasonable police officer would not have understood that the presence of police officers on the Bridge constituted implicit permission to the demonstrators to be on the Bridge roadway in contravention of the law." The Court of Appeals (Calabresi, Lynch and Livingston [dissenting]) disagrees, and the lawsuit can proceed. The Supreme Court held in 1965 that "when officials grant permission to demonstrate in a certain way, then seek to revoke that permission and arrest demonstrators, they must first give 'fair warning. '” The officers try to get around this by arguing that they sanctioned the bridge march so long as the protesters remained on the sidewalk, and that once the protesters spilled into the roadway, they were fair game for arrest; without an implicit invitation to walk along the road, the protesters got what they deserved when the officers arrested them. Qualified immunity continues to be a subject of great debate among judges, with many emphasizing that this immunity allows the police and other public officials to do their jobs without the fear of crippling lawsuits. This debate exposes the liberal-conservative judicial divide. I would guess this case is a good candidate for full court, or en banc, review.